"I don't like the waiting game. Let's play Hungry, Hungry Hippos instead." Writer of young adult historical fiction. Decent speller. Still reads the comics every morning. Can make a stellar casserole from any five random ingredients. Christian before Christian was cool. Knows the secret SCBWI handshake. It's the summer of 1924 and Gertrude Leskow has just discovered her brother Louis is gay. Complete at 60, 513 words. The Paris Hat, a lighthearted look at YA novels of a different era. Watching clips of the Judy Garland Show on Youtube. All written material and some of the images on this page are copyright and may not be reproduced without permission. 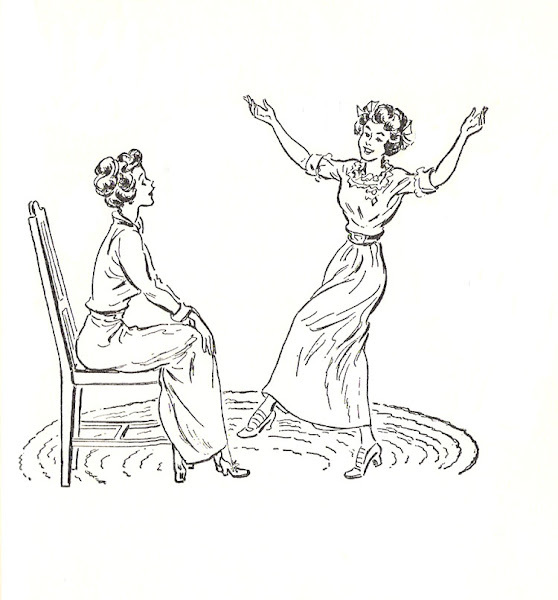 Top illustration by Vera Neville from Emily of Deep Valley by Maud Hart Lovelace. In case you're wondering, one of the girls has just stolen the other's man and is showing off that she's wearing his pin. No fear: the one who got dumped is going to find a better man later in the book. Last summer's obsession was Great Unsolved Mysteries in Canadian History. (The annoying thing about this site is that they don't tell you the answers to the mysteries. Otherwise, say goodbye to 2 hours.) This summer something in my memory brought up the tv series The Singing Detective and I've been watching the episodes one by one -- there are only 6, unfortunately, and for some reason episode 3 isn't available at all. The Singing Detective was created by Dennis Potter and originally ran in 1986 in Britain. I think it came over to the US a year or so later. I have a vague memory of watching some of it, and certainly there was a lot written about what a great series it was, with the usual note of "British TV is just so much better than American network crap." Looking back, I think it's kind of a Ur-British Drama, not in the "Upstairs, Downstairs" sense, but in the sense of it influencing modern American series like "Sopranos" and "Mad Men," ones with complex characters and layered stories. Watching these episodes has been a great lesson in storytelling. The main character, Philip Marlowe, is in a hospital ward with psoriatic arthritis. He drifts back and forth between past and present, sometimes imagining a 40s-style noir detective story (he's a writer), sometimes caught in his own past. Sometimes the threads mingle, with fictional characters talking to non-fictional. Sometimes everyone in the ward bursts into song. But each vignette is tight, clean-cut, meaningful: the characters emerge in their full complexity. You feel pity for Marlowe but you can see he is the author of some of his own misfortunes. He can be gratingly, glaring wrong but he's a human being. When The Singing Detective was originally on I didn't see too much of it. I think it was on at a bad time and perhaps I came in in the middle of the series and didn't understand what was going on. One of the things I did love was the songs. I think the first time I ever heard the song "Ac-cent-u-ate the Positive" was in the link attached below. I thought it was fantastic -- I'd never seen anything like it. I definitely recommend watching the series, for anyone interested in good storytelling or just good drama. This time of year in the desert is the last blossoming before the really hot heat begins. It passes too quickly. It always makes me think of Daisy's line in The Great Gatsby: "Don't you always look for the longest day of the year, and then miss it?" OK, it passed by without me noticing, much. Last Sunday I was daydreaming my way through the announcements at church (for some reason we do announcements at the end of the service, when people are already half-out of their seats, ready to leave) when I heard someone say they needed people to recite poetry for the talent show the youth is putting on. Well, I had kind of thought poetry recitals went out with the hoop skirt, but I said, yes, I can do that. So find a poem you like and let me know. I have the kind of mind that goes completely blank if asked to name a favorite writer, poem, color, or flavor of ice cream. I run to enthusiams. Everything changes, month to month, year to year, and going back along the trail to find what I have liked in the past is difficult. And there's the audience to think of, mostly parishoners and parents. Can't be anything really old, with words people can't catch or don't understand. One of my recent favorite poems, Thomas Gray's "On a Favorite Cat ,Drowned in a Tub of Goldfishes", fell into the this category. Eventually, after working through Gerard Manley Hopkins "Spring" and Edwin Muir's "The Horses", I chose two poems. The first is "Late Fragment" by Raymond Carver. The second is a selection from "East Coker" by T.S. Eliot. Didn't really mean to be gone so long, but it's a sign that I'm working a lot. Two more or less simultaneous projects, a half-written short story, stuff I've sent out. And you know how thinking up blog posts goes...something happens, or you have an interesting thought, yeah, I can work up something about that, but then a day or two passes, and the thought as well, it doesn't seem worth the bother any more. Blogging has turned out differently than I expected -- but then, what doesn't in life? In the beginning, there was something charged about it, for me, a sense of meeting people, making connections, learning about markets, a frantic sense that we were all about to break through to success -- getting an agent, being published. Then there was the question of what sort of blog yours was going to be. Many of us started out trying to focus on writing -- mechanics, progress, insights. Well, it turns out that not only is it hard to write continually about writing, it's even a little boring. And mendacious. If in July you bragged that you finished 20,000 words, in September you might not want to admit that you ended up scrapping 19,000 of them and starting over. Some people went in the direction of book reviews. I could never do that -- ugh, life's too short, and besides, it turns out that while I can say exactly in exquisite detail why I don't like a book, when I do like a book all I can think of are bland statements like "It was great!" Some wrote about personal things, but in this, as in a diary, a lot tends to get left out and you have to be comfortable with that. And finally, a lot of people just drifted away. When I look at my blog roll, which I've never really bothered to update, I think there are more inactive blogs than not. As for the the success we all anticipated -- well, yes, that has happened. Livia Blackburne got an agent and has a book coming out. So does Loretta of Get Back, Loretta. A bunch of others have self-published. Of those who dropped off, well, I still cherish the hope that some of them are writing, just not blogging about it. This blog has gone all over the place -- sometimes about books, sometimes about writing, sometimes a lot more vague. I don't worry much about it because for me blogging has it's place, and it's way down there, after writing and family and reading. You know what you're good at and what you're not and I've never felt that blogging was the best use of my time. This doesn't mean that I intend to quit doing it. In fact, I think the decision I made to get into blogging was one of the best of my life. Essentially, all my life, I'd been writing in a cave. When I first started writing, as a child, it wasn't even writing, it was thinking. I spun out stories in my head, never writing anything down, out of fear. This became a fixed habit, for years, even when I did start writing. Never show it to anyone who might be objective, never ask for criticism. I had no problem sending stuff out, and dealing with the subsequent rejection. (After all, everyone gets rejected, Emily Dickinson, etc, etc.) I had a problem with communicating or sharing with other writers or people who might know something about writing. I was missing a crucial step and never knew it. Blogging was the beginning of coming out of the cave. However long I go without blogging, I have never regretted the people I've gotten to know through this blog and never ceased to follow what they post. So expect more posts about rain and writing and the occasional passing thought. And if a month or so passes in between them, just figure it means I'm writing. Imagine a world where a high school student expresses an opinion to a friend. A few days later the student disappears. Family and friends question and search, receive no answers. The student has become one of the "disappeared" -- thousands of people, whose arrests as enemies of the state are never acknowledged, whose fates are never known. Sounds likea dystopian novel, right? But this actually happened, in the 1970s, in Argentina. It happened in a lot of other places, too. And it still happens today. A large part of the world's population lives through its own variation on the theme -- omnipresent police, personality cults, corruption, weird rules, fear. YA dystopian fiction often tends toward the vague and the shadowy. Evil omnipresent governments, brutal police, states based on scarcity or overly advanced technology. But governments are composed of human beings and human beings are complicated. They collaborate, but they also resist. They love their country, they may fight for it and die for it, and yet believe the whole time that their government is wrong. Reading about the lives of people in Poland, Nazi Germany, Argentina, Iran, China I am struck by the terrible choices they had to make. It feels like there is a huge difference between their world and the comparatively safe, sane democratic world I grew up in. I think it's this gulf that drives YA dystopian fiction, this fear of "what if it happened here?" But I wish YA fiction derived more of its details from the real-life experiences of totalitarian societies, that it weren't so stuck on the single-freedom-fighter-leads-a-revolution theme. Because in real life, that doesn't happen very often. Go back to the example of Argentina for a minute. The Argentine junta that ruled in the 1970s was replaced -- through not so much a revolution as a collapse -- by a democratic government in the 1980s. Argentina has since struggled with corruption, economic problems and a disinclination to deal with the ugliness of the past. But it's basically a free country. In real life, totalitarian governments are often not quite as powerful as they appear to be. People resist in thousands of little ways, people push towards freedom. And that complexity, the gritty reality of daily life, is a great story. I'm really not here to go into mourning, or to offer doom and gloom, though. I mean, look at the New Yorkers on tv, listen to them. Three of the subway tunnels are already pumped out. People are walking to work. There will probably be partial subway service tomorrow. I remember one year, when I was at NYU when it was suddenly discovered that the Williamsburg Bridge was in imminent danger of collapse, something everyone seemed to take in stride. The bridge was closed for a year and subway service was rerouted. For weeks after 9/11 there was no subway service to lower Manhattan. Somehow lines were rerouted, bus service filled in. At my first job in Mahattan one of the other employees reminisced one day about the great transit strike in the 1970s, and how everyone walked over the Brooklyn Bridge. "You got the feeling," he said, "that if you could survive that, you could survive anything." It's very fashionable, particularly in dystopian scenarios, to see huge cites as vulnerable. No doubt, because of quirks of geography and history, they are. But huge cities are also very flexible. They have the will, the ability (and the financial incentives) to get things done, quickly. I think anyone voting on this issue should first go to the Paseo Verde library on a Saturday morning. The conference rooms are booked up, the computers are occupied, there are kids everywhere, teens in the teen section. It's a place for study but it's also a public space. I am ashamed, as a writer, that I take for granted my use of the library. Of course they have the book. Of course they'll get the book. Of course I can get anything I want, right at my fingertips, never thinking where it comes from, never thinking who pays for it. So I'll say it now: my greatest thanks, to the Henderson and Las Vegas-Clark County libraries, and by extension to the voters and taxpayers who fund them. We're all in this together. "She stood the whole day long on the roof and waited; perhaps she is waiting there still. But he wandered through the world and told stories..."
from "The Flying Trunk," Hans Christian Anderson.